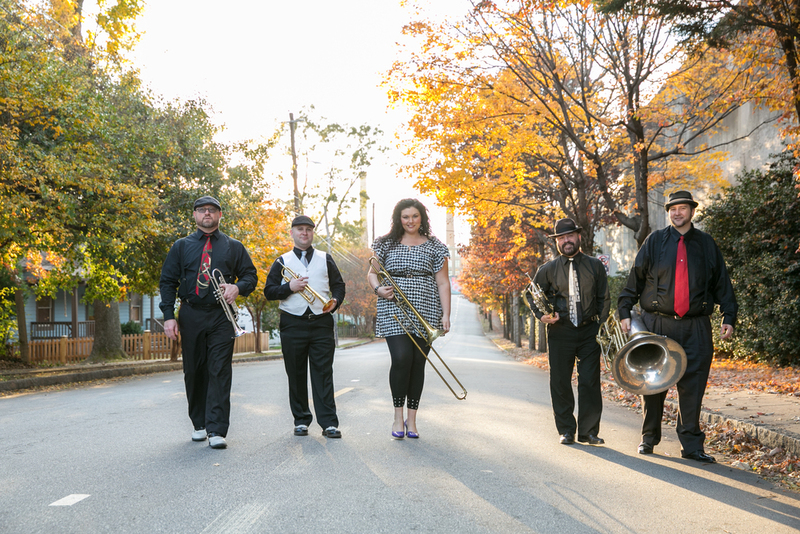 Formed by some of the top professional musicians in the Southeast, individual members of MBQ have performed with the Atlanta Symphony, Atlanta Opera and numerous other regional groups. But it doesn’t begin and end with individual talent. Many professional ensembles exist as side projects where members only get together when the need arises. We at MBQ are dedicated to weekly rehearsals to create and maintain a fine-tuned ensemble that will far exceed the musical capabilities of any part-time performing group. Paul received his musical training at UNC-Greensboro (B.M. in Trumpet Performance, 1996) and the University of Missouri (M.M. in Trumpet Performance, 1999). He has held the Principal Cornet position with the award-winning Georgia Brass Band (GBB) since 2002, where he is frequently featured as a soloist. Paul has also served as Interim Principal Trumpet with the Tuscaloosa Symphony for the 2006-07 season and has performed with the Atlanta Opera, Cobb Symphony, Columbus Symphony, Gainesville Symphony, Ludwig Symphony, Macon Symphony, New Atlanta Philharmonic and Ocmulgee Symphony. He also performs as substitute with the Atlanta Symphony Orchestra (since 2003), and has been performing with the Atlanta Opera and Atlanta Ballet, and plays Principal Trumpet with the Albany and Gainesville Symphonies. Jonathan does chamber work with groups such as members of the Midtown Brass, Atlanta Symphony Brass, Mercer University Faculty Brass, and Columbus State University Faculty Brass. As a solo performer he has performed with the Mercer University Wind Ensemble (Turrin's "Fandango" and the Boehme Concerto in F Minor). Alan Brown, a native of Atlanta, completed his Bachelor of Music at Georgia State University, and his Master of Music degree from the Manhattan School of Music in 1991 in horn performance. He graduated from the Berklee College of Music in 2003, majoring in “Film Scoring” and “Contemporary Writing and Production.” He has performed french horn professionally with many orchestras and ensembles in the Southeast, New England and the San Francisco Bay Area including the Atlanta Ballet Orchestra, the Atlanta Opera Orchestra, the Boston Ballet Orchestra and the Napa Valley Symphony. His french horn teaching credentials include serving on the faculty at Georgia State and Clayton State University. Alan has done over 40 arrangements for woodwind and brass quintets. He is also one of the staff pianists for the Atlanta Ballet and is a full-time registered nurse in oncology at Wellstar Kennestone Hospital. Hollie graduated with her B.M. in Music Performance from Georgia State University and has studied at the acclaimed Cleveland Institute of Music. As a performer, Hollie has played with the Atlanta Symphony Orchestra as well as the Columbus, Augusta, Cobb, Carroll, Youngstown, and Warren Symphony Orchestras, among others. She has been principal trombonist with the Carla Rosa Opera Company U.S. Tour, the Sigmund Romberg Tour, and has performed on several occasions with the Atlanta Pops Orchestra, including a four-week tour to Taiwan. Hollie is also Principal Trombone with the Georgia Brass Band. Bill is a native of New Jersey. He began teaching and freelancing in Atlanta in 2001 while he was a member of the Army Ground Forces Band. Currently he plays tuba with the Midtown Brass Quintet, the acclaimed Georgia Brass Band, the New Atlanta Philharmonic, the John's Creek Symphony Orchestra and the Ludwig Symphony. He has also performed with the Alabama, Columbus, Macon, Cobb and Hilton Head Symphonies, the Savannah Philharmonic, the Atlanta Brass Society, The Atlanta Ballet and the Peachtree Brass. As a soloist he has appeared with the Army Ground Forces Band, the New Atlanta Philharmonic, the Ludwig Symphony, and the New Jersey-based South Orange Symphony, delighting audiences of all ages with his dynamic interpretations of both standard and lesser known works for tuba. In addition to his performance schedule, Mr. Pritchard is a dedicated teacher of his craft, giving private lessons and master classes on euphonium and trombone, as well as the Low Brass professor at Georgia College and State University and Lee University. Bill holds a Bachelor of Arts degree in music management from William Paterson University and a Master of Arts in classical performance from the Eastman School of Music.